As discussed in the Short History, Hegewisch was built originally as a company town for the United States Rolling Stock Company, a company that was going to build rail cars for railroad companies. What wasn't discussed, is that the company had already gone bankrupt once when Adolph Hegewisch became president of the company in 1892. Hegewisch was no stranger to railroads, or rail supply companies having spent several decades in managing rail lines and sitting on the boards of many east coast rail companies. He knew that if his company was to have any chance of success it would need to be located in an area that showed great potential for rail road growth. The area he chose was an area where seven different rail lines entered met before heading north to Chicago. Adolph Hegewisch planned to built his company town tight in the middle of this important junction. Sharing the line roughly paralleled current day Brainard, crossing 130th just West of the Ford Plant. The track is now owned by Norfolk Southern. Sharing the line roughly paralleled current day Brainard, crossing 130th between Torrence Avenue and Saginaw. The line was removed in the late 1990s. The bridge crossing the Calumet River around 126th and Torrence remains in place. Sharing the line roughly paralleled current day Brainard, crossing 130th just West of the Ford Plant. The NYC&St.L became known as the Nickel Plate. The Nickel Plate was later merged into Norfolk & Western before finally becoming part of Norfolk Southern, the current owner of this line. Sharing the line cuts North through Hegewisch between Mackinaw and Green Bay Avenues and following the Western edge of old Hyde Lake. The CRR was part of South Chicago and Southern Railway which was owned by the Pennsylvania Railroad Company. The Pennsy went bankrupt in 1970. Today the track belongs to Norfolk Southern. Sharing the line cuts North through Hegewisch between Mackinaw and Green Bay Avenues and and following the Western edge of old Hyde Lake. The line went through several owners including the Chicago, Pittsburgh & Ft. Wayne Railway. As with the CRR, this line became part of the Pennsylvania Rail Road. Today the track line in Hegewisch belongs to Norfolk Southern. Parts further East belong to CSX. 7. RI & P RR, the Rock Island & Pacific Railway. Sharing the line cuts North through Hegewisch between Mackinaw and Green Bay Avenues before around Eastern edge old Hyde Lake at 132nd Street. 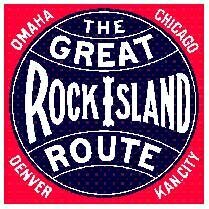 Later, the Chicago, Rock Island & Pacific, and commonly called the Rock Island Island. The Rock faced a slow painful death from 1975 to 1985. The former Rock Island track now belongs to Norfolk Southern. 8. CLS&SB RR, the Chicago, Lake Shore & South Bend Railway (1909) Originally the Chicago & Indiana Air Line Railway. After a few name changes the line becomes the CSS&SB RR or Chicago South Shore & South Bend Railroad. Today the line is two companies. operating over the same lines. The CSS&SB turned over operations of the Passenger service to the NICTD but retains freight operation. The line runs through Hegewisch along Brainard Avenue then follows 130th Street until it reaches the Dan Ryan Expressway and veers north around Cottage Grove Ave. The line remains in operation to this date. 9. IHB RR, the Indiana Harbor Belt. The line runs north roughly along the border between Illinois and Indiana. It is still in service today and can be seen from 134th Street and the border. The Norfolk Southern owns most of the tracks in the Hegewisch Area and will be a common sight for the train enthusiast. However, the BNSF is also a very common sighting. Chicago remains and important rail hub and as such all of the top rail lines can be seen in the area. Along with the mainline railroads two short line freights and the last of the true interurbans are common sights. The following is a list of the most common lines in alphabetic order by abbreviation. The most common freight car is the auto carrier because of the nearby Ford Plant. The auto carriers are leased from every main line as well as private companies. Mixed freight trains are also a common sight with every variety of intermodals (double stacks, road railers, etc.) represented. Coil cars, gondolas, tankers, and grain hoppers are also quite common as well as a variety of box cars. 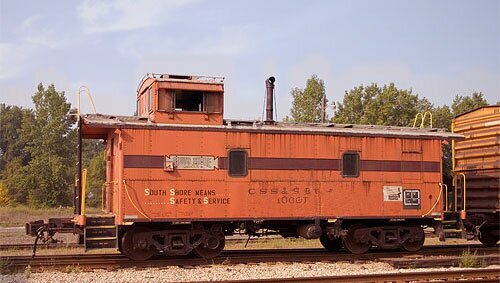 A common sight is also the bright orange caboose of the South shore freight which is used regularly on short hauls. Much of the older rolling stock from merged rail lines has been repainted with the new paint schemes however some of the old colors still pop up now and then. A common sight is old BN (Burlington Northern) Green box cars. A rarer sight is a very old sky blue Great Northern box car last seen about a year ago. The bottle cars used for molten ore are also become a thing of the past. The best time to view trains in almost anytime along Brainard Avenue. However, if you're looking for an IHB train you'll be better off looking on 134th Street near the state line. This is an unguarded crossing so be careful. The best time is early morning and evening.